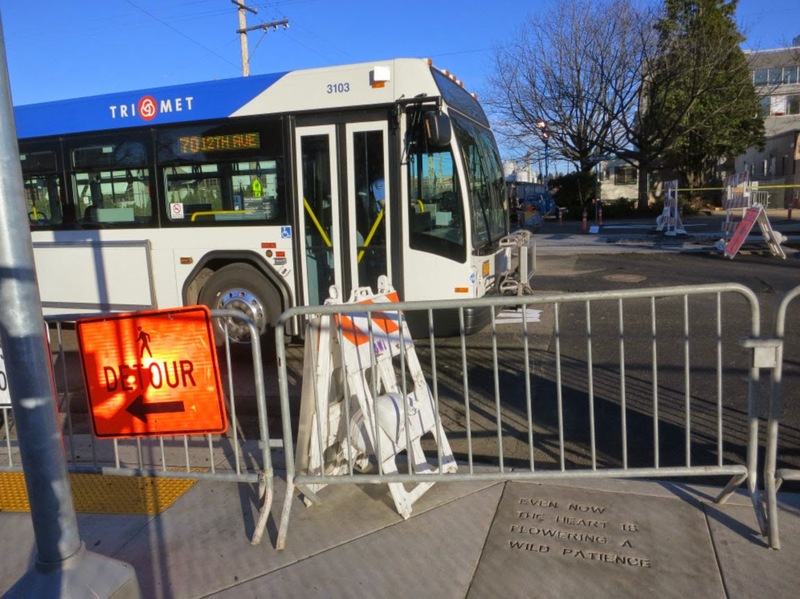 These photos were all taken on SE 17th except for the last two, which were taken in Milwaukie. 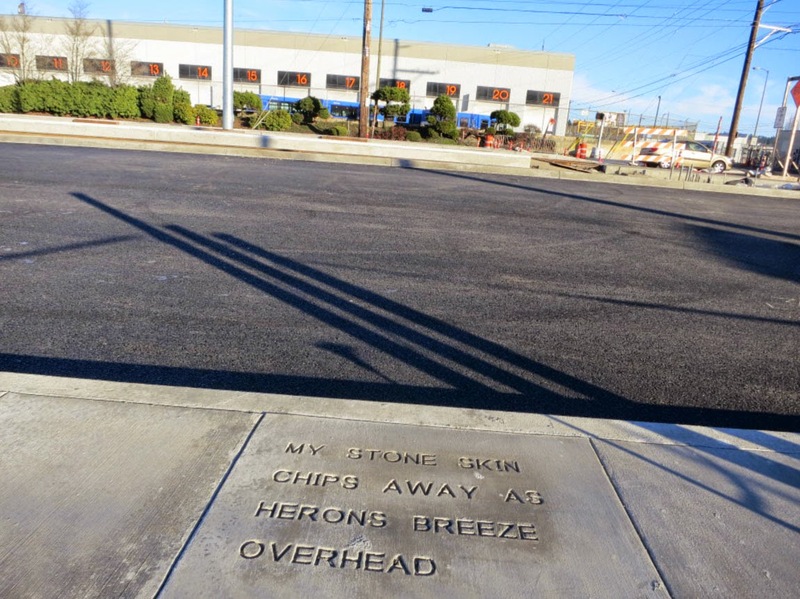 Walking the length of 17th from SE Rhine to McLoughlin, I found quite a few new stamps and retook some photos of others. 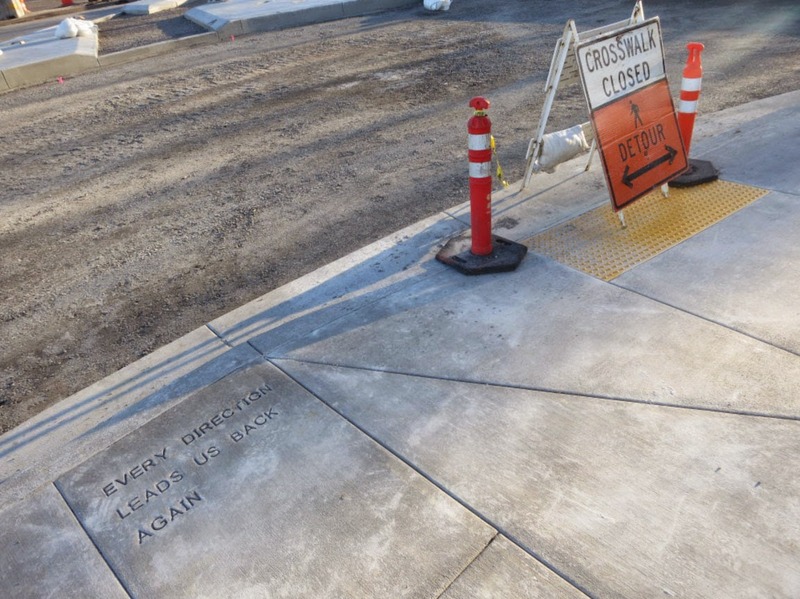 The photos will be in order, north to south with the west side first then I’ll cross the street near McLoughlin and come back on 17th on the east side, south to north. 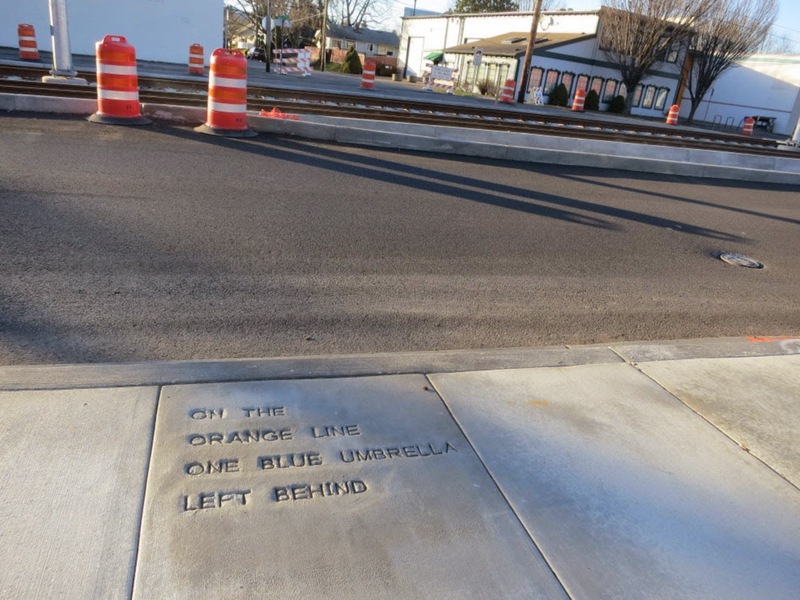 I’ll note which cross-street each stamp is nearest to. 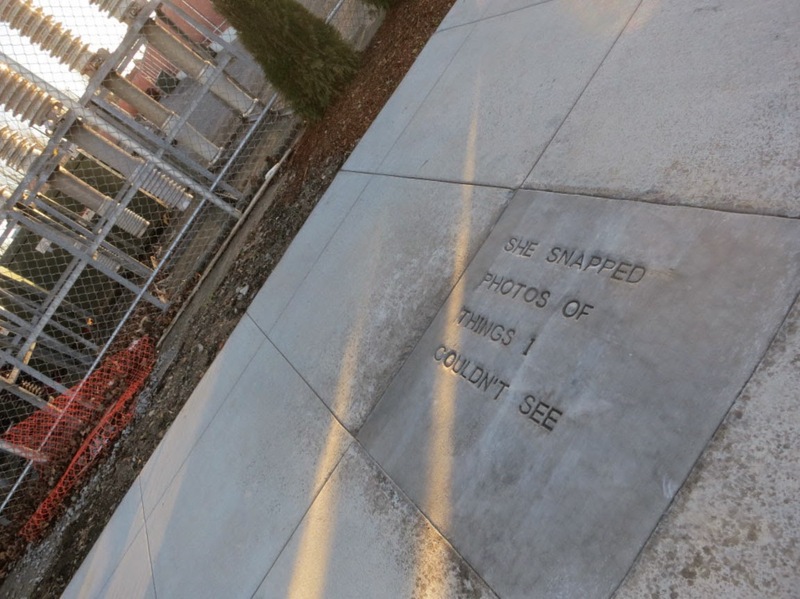 It’s been interesting to observe the quality of the stamps and how they relate to the words of the ‘lines’. 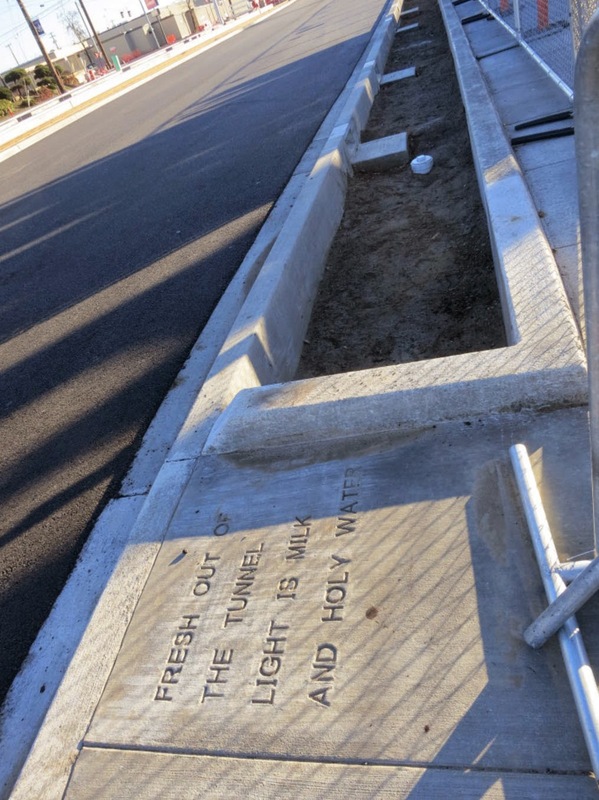 The one just below, containing a little extra grit, currently reads like it was written or read fast. 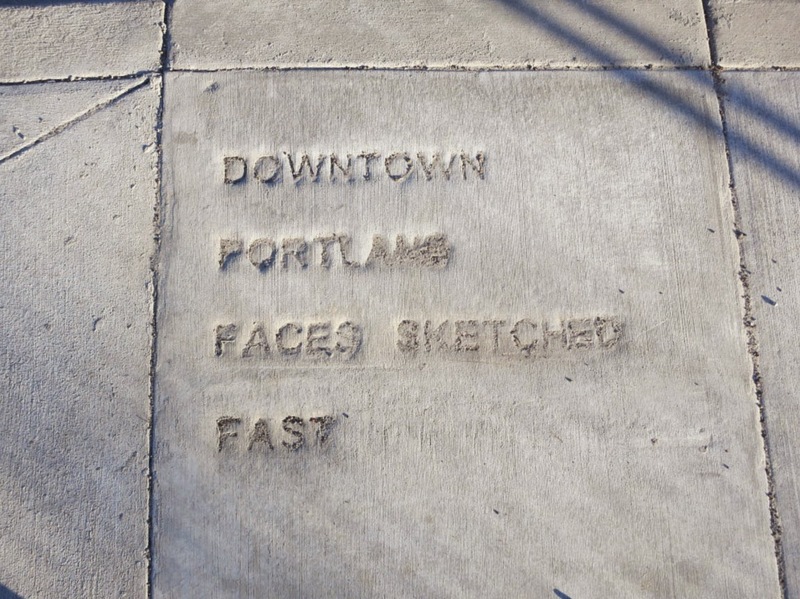 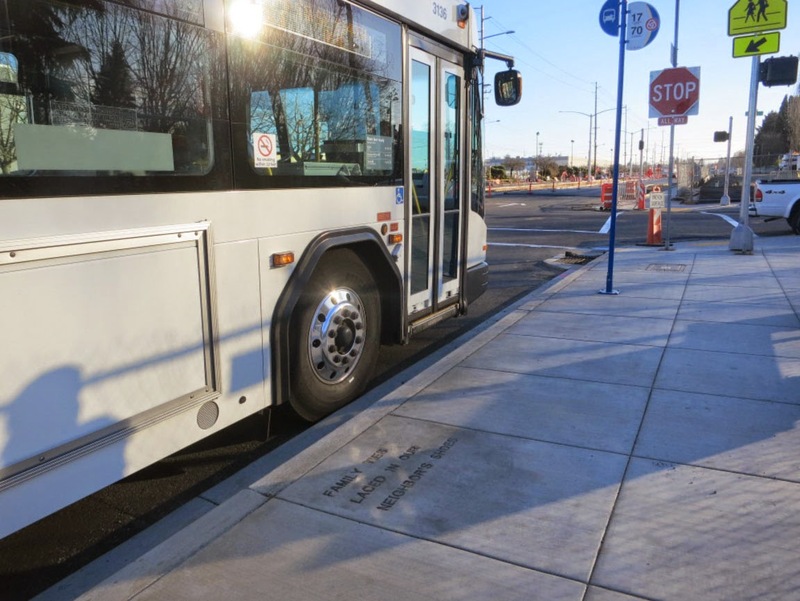 DOWNTOWN PORTLAND FACES SKETCHED FAST, by Wendy Moidel south of SE Rhone. 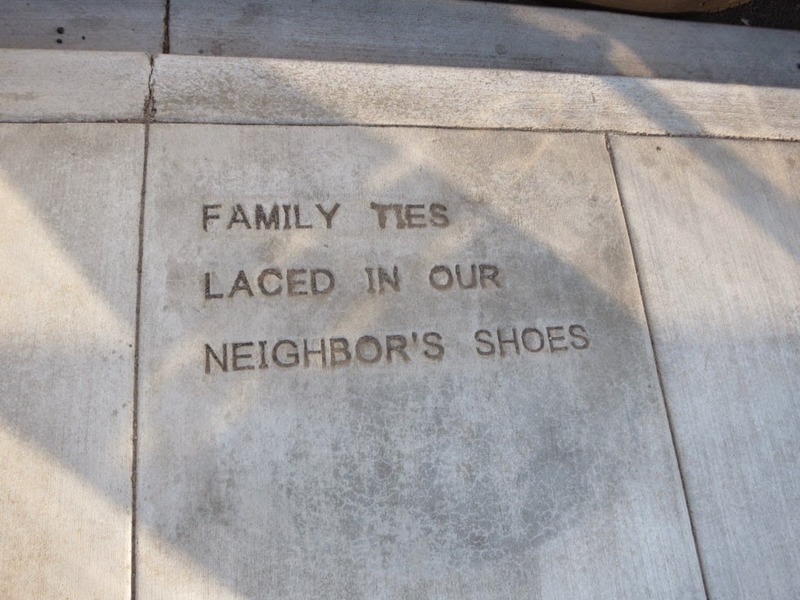 FAMILY TIES LACED IN OUR NEIGHBOR’S SHOES, by Garret Potter, north of SE Center St. 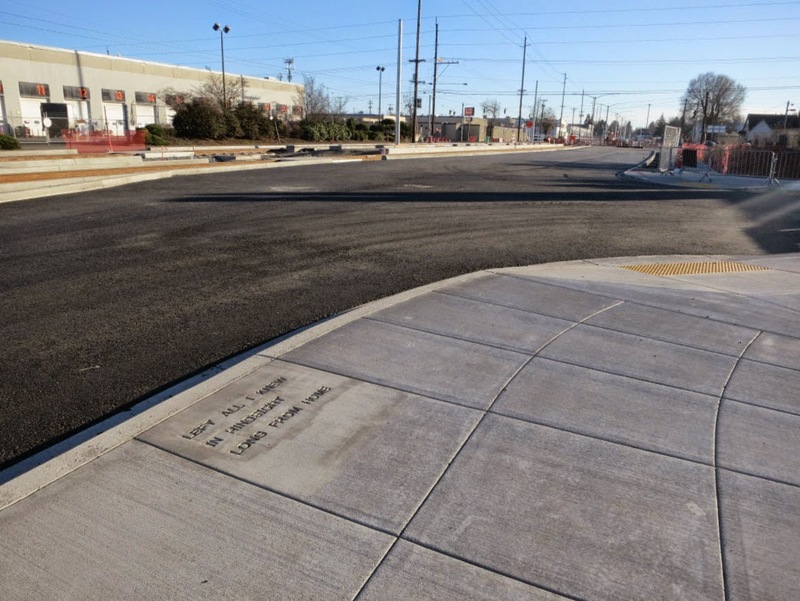 EVEN NOW THE HEART IS FLOWERING A WILD PATIENCE, by Amy Schutzer, south of SE Center St. 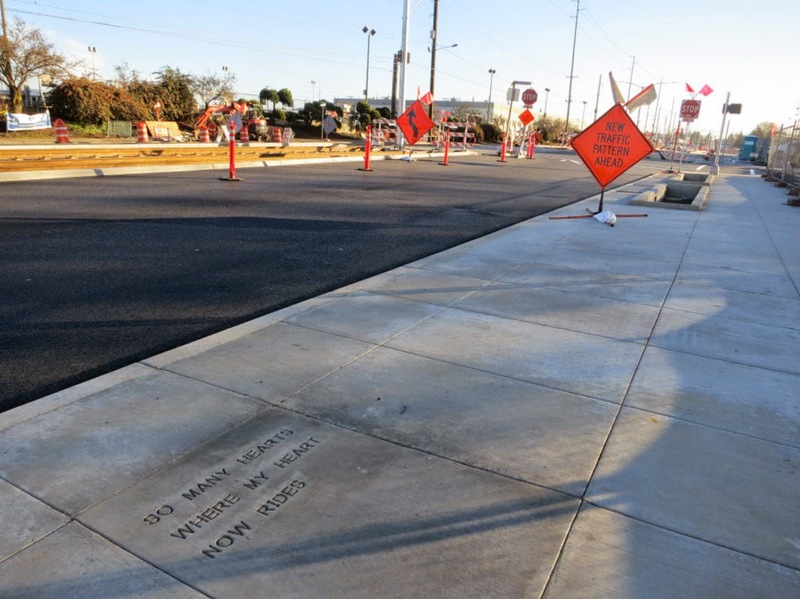 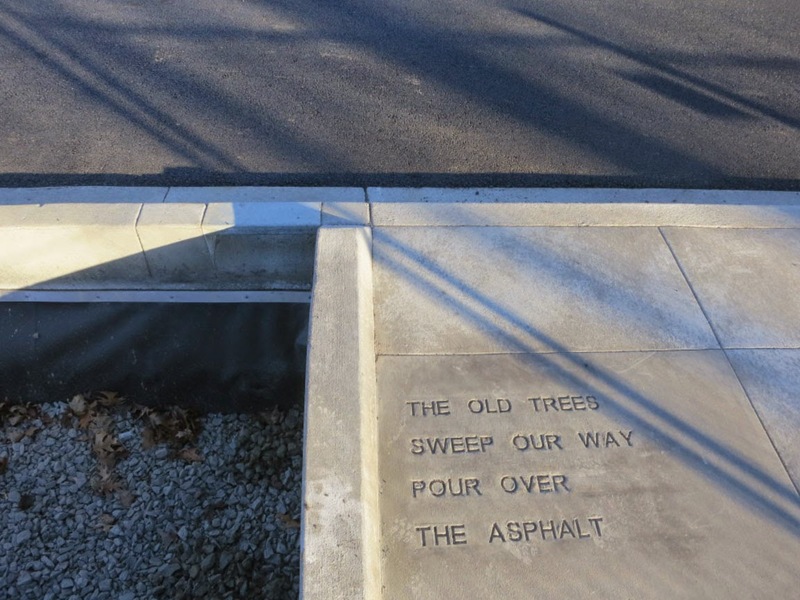 THE OLD TREES SWEEP OUR WAY POUR OVER THE ASPHALT, by Ayelet Amittay, south of SE Center St. 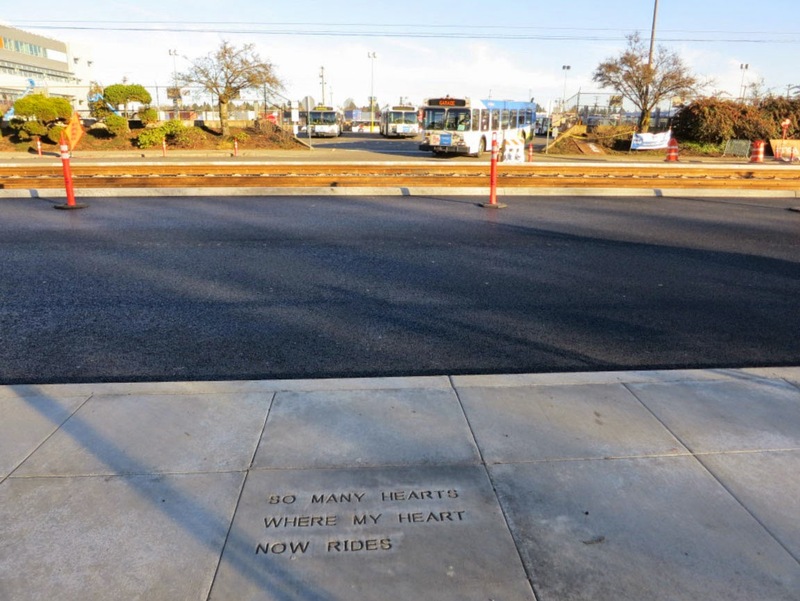 SO MANY HEARTS WHERE MY HEART NOW RIDES, by Lana Hechtman Ayers, north of SE Boise. 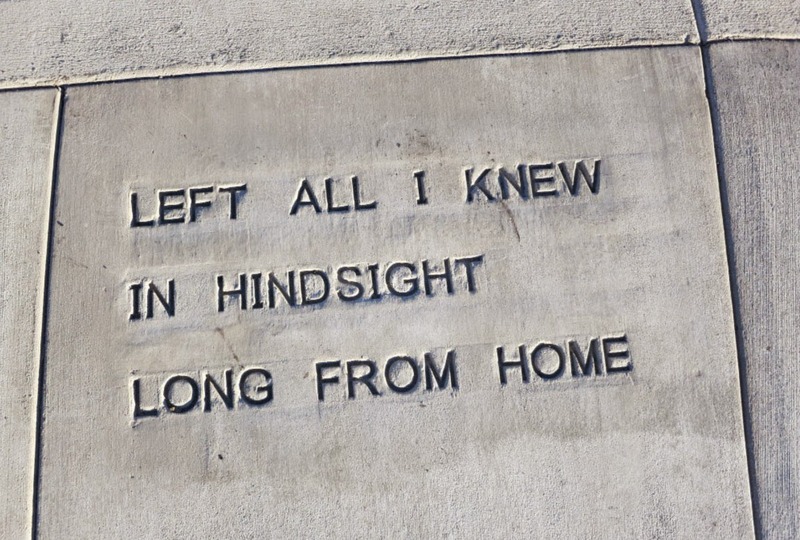 LEFT ALL I KNEW IN HINDSIGHT LONG FROM HOME, by Jessica Samuelsen, north of SE Mall. 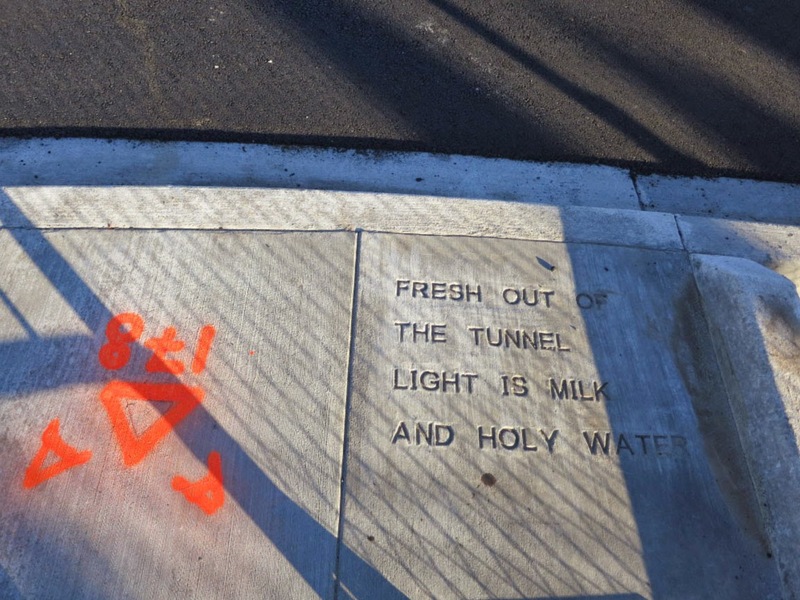 FRESH OUT OF THE TUNNEL LIGHT IS MILK AND HOLY WATER by Amber T. May, south of SE Mall. 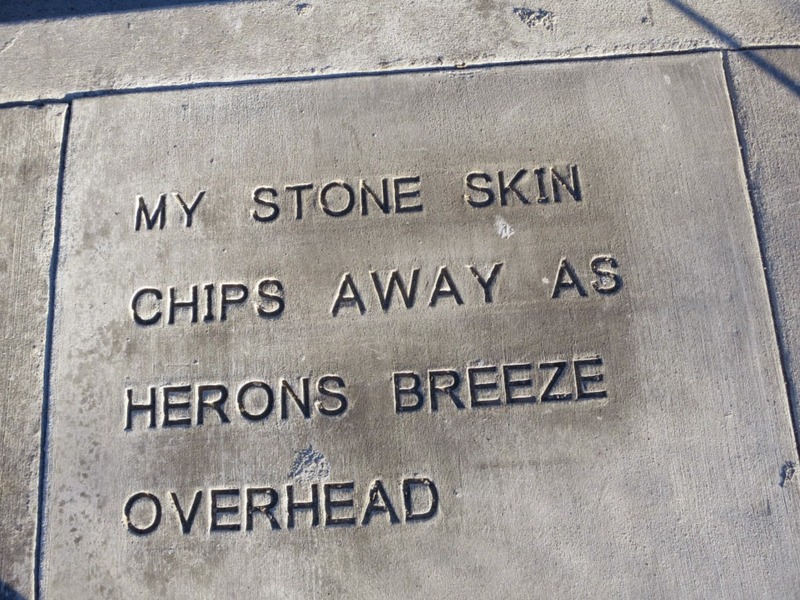 MY STONE SKIN CHIPS AWAY AS HERONS BREEZE OVERHEAD, by Mike Aspros, north of SE Holgate. 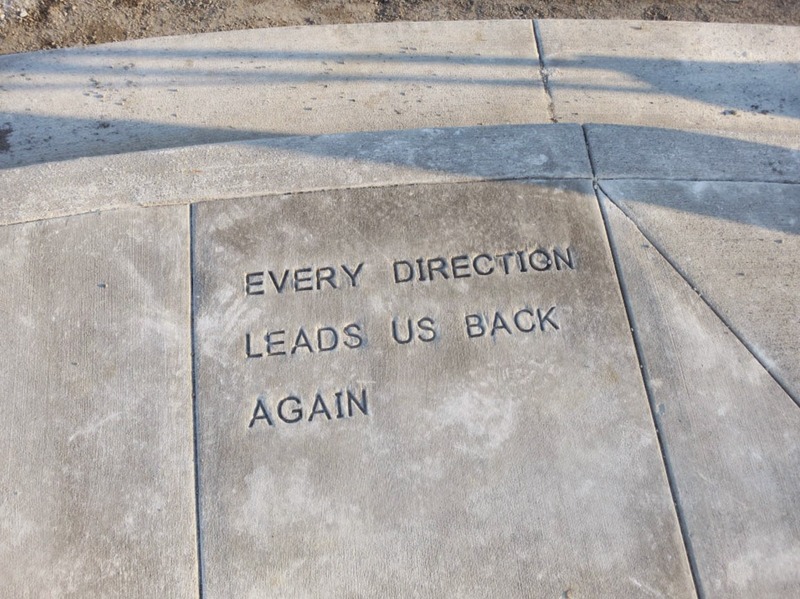 EVERY DIRECTION LEADS US BACK AGAIN, by Casey Neil, just north of McLoughlin. 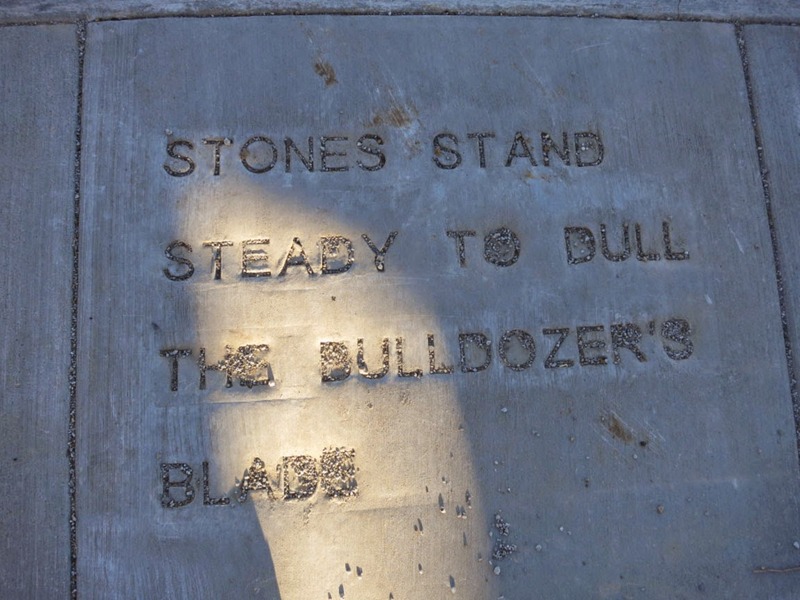 STONES STAND READY TO DULL THE BULLDOZER’S BLADE, by Mike Aspros, north of SE Holgate. 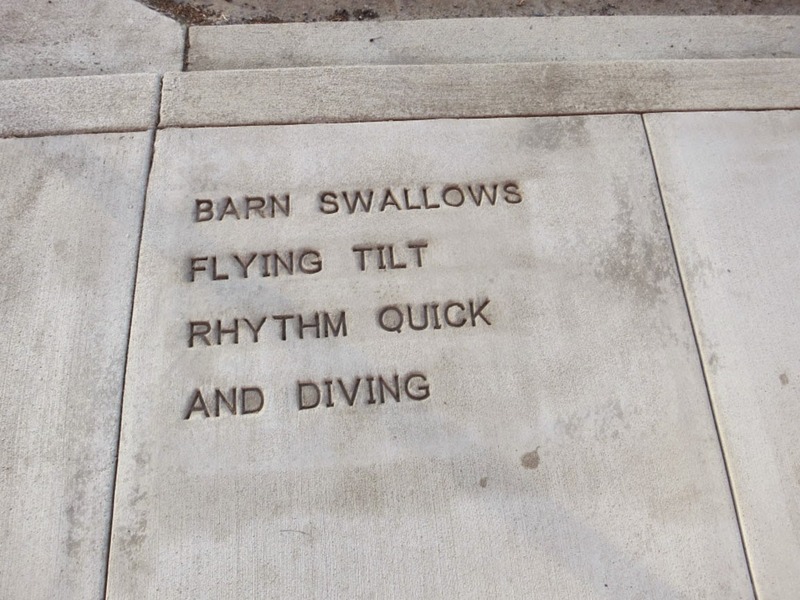 BARN SWALLOWS FLYING TILT RHYTHM QUICK AND DIVING, by Melanie Green, across from SE Rhone. 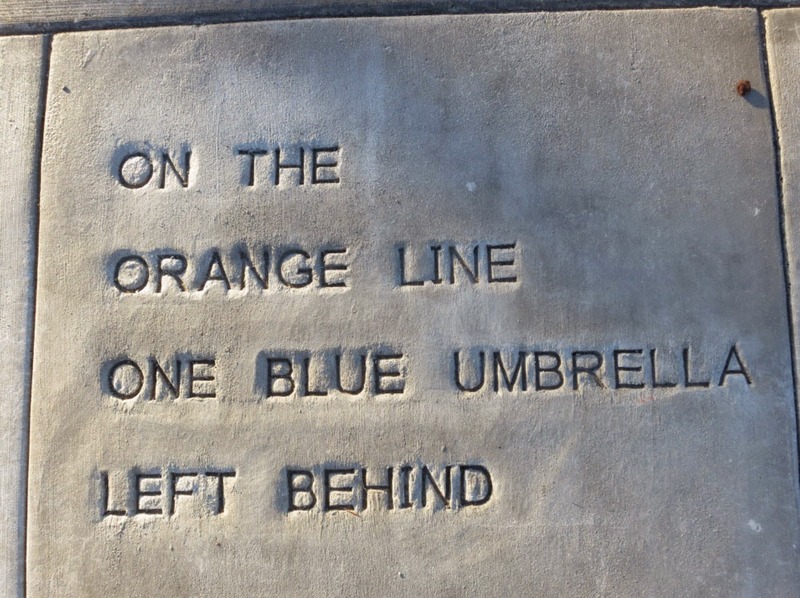 ON THE ORANGE LINE ONE BLUE UMBRELLA LEFT BEHIND, by M, south of SE Lafayette. 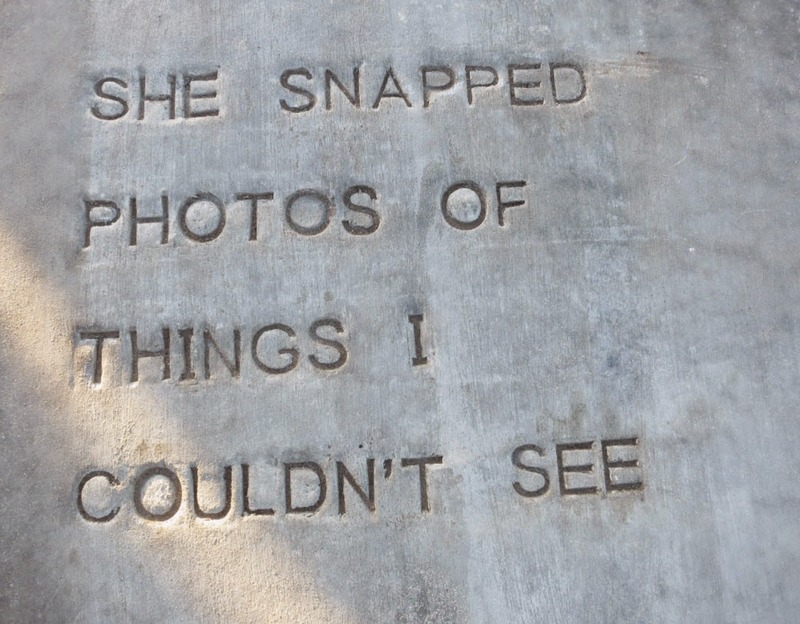 SHE SNAPPED PHOTOS OF THINGS I COULDN’T SEE, by Jules Boykoff, south of SE Rhine. 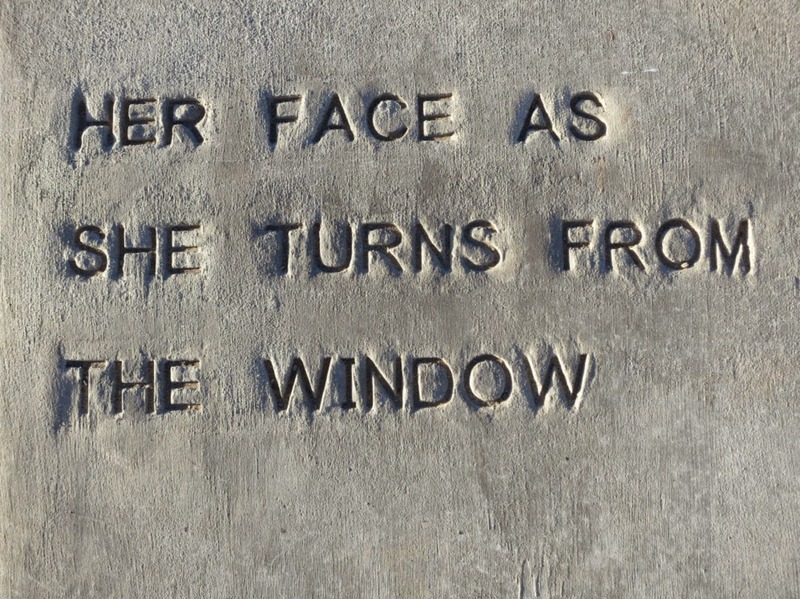 HER FACE AS SHE TURNS FROM THE WINDOW, by Anne Elizabeth Shaw, south of SE Haig. 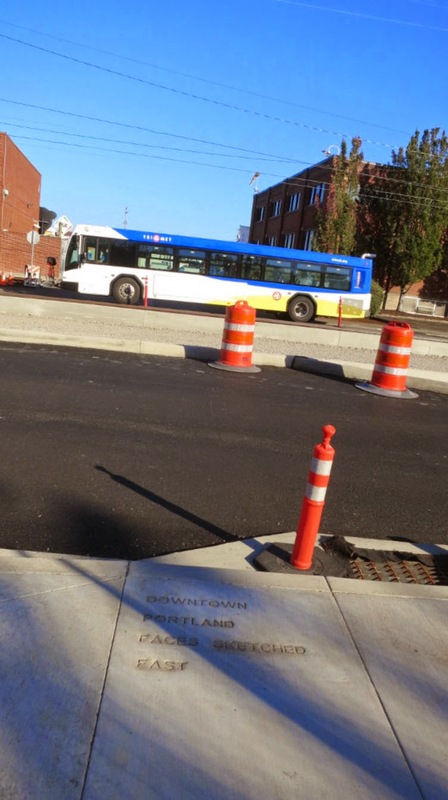 The next couple of photos were taken in Milwaukie. 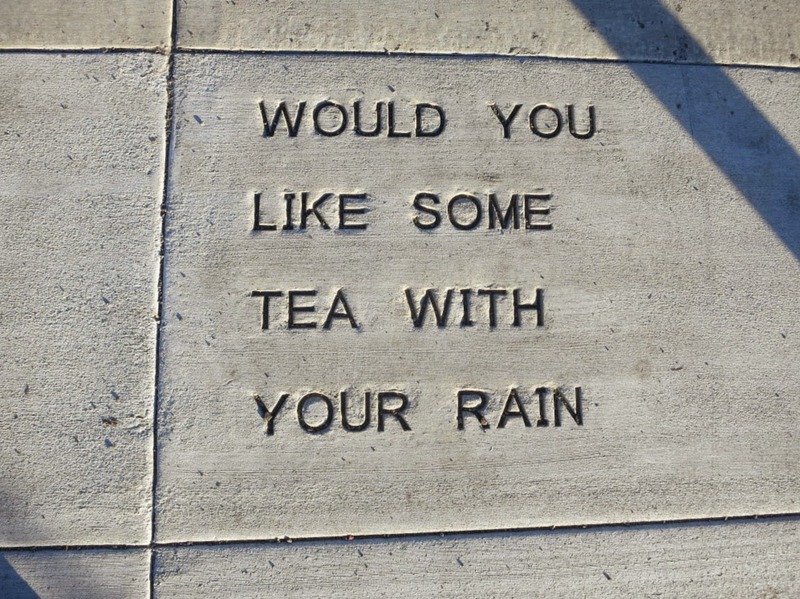 WOULD YOU LIKE SOME TEA WITH YOUR RAIN, by Kunal Mehra, On SE Washington St. just east of SE 21St. 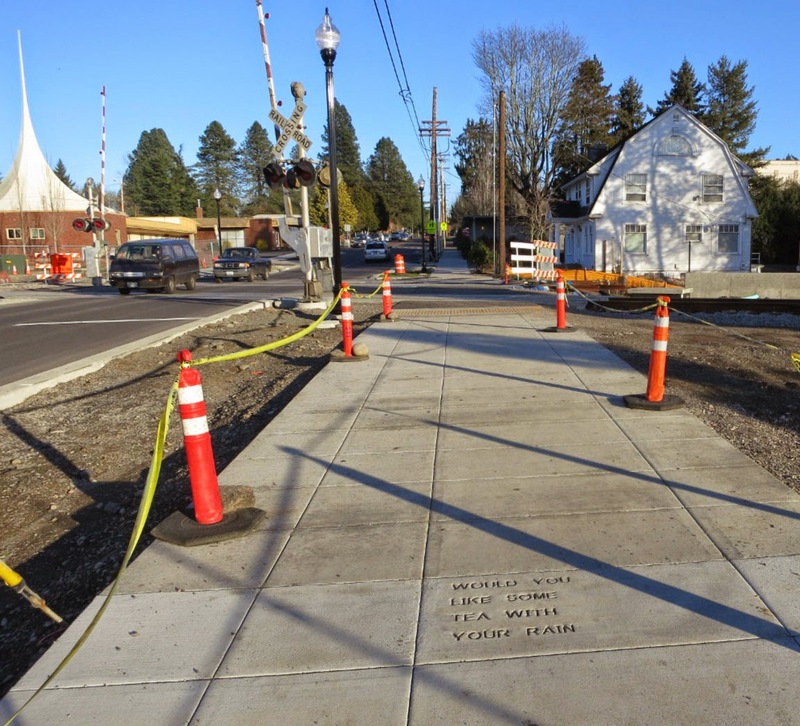 in Milwaukie. 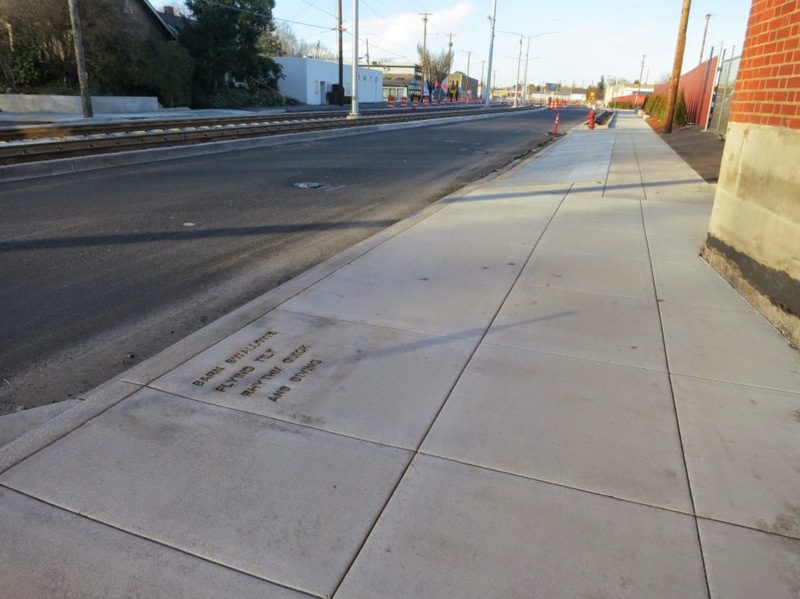 WOULD YOU LIKE SOME TEA WITH YOUR RAIN, by Kunal Mehra, On SE Washington St. just east of SE 21 St. in Milwaukie.